This summer I’ve seen some great live music including Eminem, St. Vincent, Beck, Aerosmith, and Ryan Adams (covering the entire Rolling Stones Exile on Main Street album). Two bands I saw stuck me as a fascinating contrast of performance styles: U2 and Dead and Company. It got me thinking about how we work no matter our profession. When I saw U2 a few weeks ago, I bought a General Admission ticket. Prior to the show, I studied where the band sets up for the handful of songs they do from the subsidiary "B stage" and I arrived early and positioned myself at the very best spot to see the band. I was way up at the very front. So when Bono and company were playing from this small stage, I was facing the drums and in perfect position just a few feet from the band. That gave me an awesome view to study the musicians in action. What I noticed is that the U2 show was choreographed like a Broadway show. Everything was planned, all the way down to the person handing Bono a water bottle at an exact spot between two songs that clearly was the same each night. I checked out Setlist.fm for U2 and wasn’t surprised that every show is the same songs in the same order. U2 was an amazing show from a tight band at the top of their game. On the other side of the spectrum was Dead and Company, the current lineup of Grateful Dead members Bob Weir, Mickey Hart and Billy Kreutzmann with John Mayer playing the Jerry Garcia role, Oteil Burbridge on bass, and Jeff Chimenti on keyboards. I was at the summer tour opener again way up front so I can see the band interact. As always, the show was focused on improvisation. Every show features a different set list, which is a big reason why I’ve been to over 70 shows by the Grateful Dead or bands including founding members of the Dead. 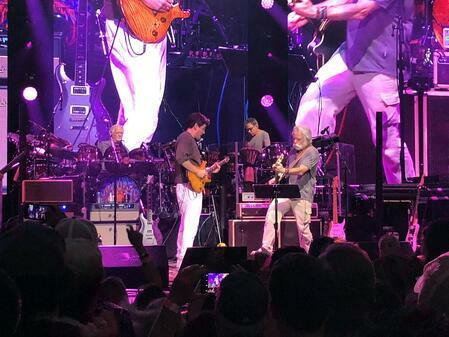 As Dead and Company goes into a song, Althea for example, the musicians don’t know how long they will jam on it. The song might go 8 minutes or it might go 15 minutes. Vocals are sometimes forgotten. Frankly, sometimes it’s not very good. But when they are on, Dead and Company is absolutely stellar. 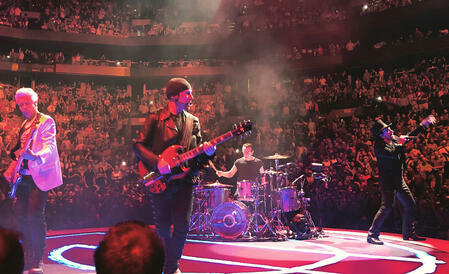 The most interesting contrast for me to see up close was that the members of U2 don’t interact much on stage. They each play their individual parts as they have done for four decades. On the other hand, members of Dead and Company are constantly focused on what their band mates are doing. They play off of one another. They give each other real-time cues. You can even see these contrasts in the two photos I shot. U2 are facing away from each other while John Mayer and Bob Weir are facing each other. Aren’t these contrasts sort of like how we all work? Sometimes we’re just making stuff up and riffing off others and it works. Other times we follow a tried and true path that we know by heart. Some people prefer one approach and some prefer the other. There’s no right or wrong way as long as you’re focused on your art and are true to yourself. As I was thinking about U2 vs Dead and Company and considering writing this blog post, I read a review of the new David Byrne American Utopia tour. Byrne was founding member, principal songwriter, and lead singer and guitarist of the Talking Heads, one of my all time favorite bands. I’m seeing the David Byrne show in a few weeks. I loved Byrne’s book How Music Works. In it, he talks about his highly choreographed shows but explains they’re still very natural. Here’s a quote from an article in the Financial Times titled "David Byrne, Hammersmith Apollo, London — planned to perfection". So maybe there is a middle ground too!